This has got to be one of my favourite and most relaxing baths ever. I usually prefer bubble bars over bath bombs because I do like a bit of a show and lots of lovely bubbles to soak in. But this bath bomb was just spectacular. As the beautiful purple orb-like bomb whizzed around the bath, it left a trail of yellow and white shimmer - just like a shooting star. The water turned a heavenly and relaxing lavender colour and the sensual scent of honey and toffee filled the bathroom, leaving mind and body feeling totally Zen. What did you use in your bath this evening? 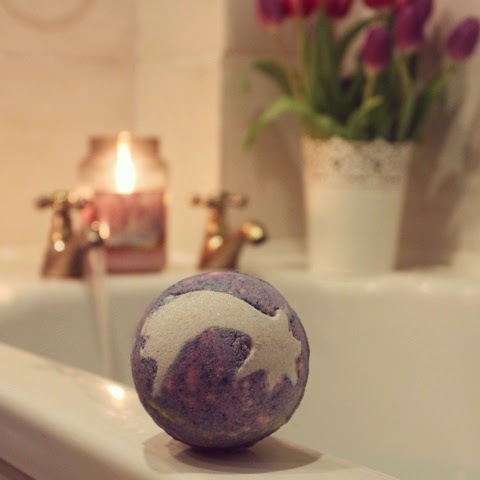 Lush Bloggers Event & Giveaway!